Prayers mark Mother Teresa's 102nd Birth Anniversary. Special prayers were held at the headquarters of the Missionaries of Charity at Kolkata (Calcutta) (West Bengal, India) on the occasion of the 102nd birth anniversary of Mother Teresa. "On the 102nd birth anniversary of Mother Teresa, I respectfully bow my head to pay my love and gratitude to the great soul. She lived a life of dedication, devotion and loving care to serve the poor and terminally ill who have no support to look for. They have nothing to offer, but Mother showed the world that those helpless and distressed are creatures of God and they can return love and affection to all. Let us strive to put smiles on the faces of the poor and needy people of the country. That will be the most befitting tribute to Mother Teresa," West Bengal Chief Minister Mamata Banarjee said. Superior General of Missionaries of Charity, Sister Prema, said that we should follow the teachings of Mother and spread the message of love and compassion. 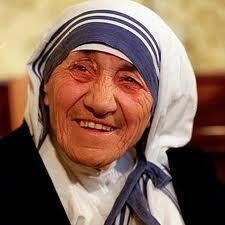 Mother Teresa was born as Agnes Gonxha Bojaxhiu on August 26, 1910 in Skopje, (Albania/Republic of Macedonia). But Mother Teresa considered 27 August, the day she was baptized, to be her "true birthday". Agnes left home at age 18 to join the Sisters of Loreto in Ireland, as a missionary. There she received the name Sister Mary Teresa. She never again saw her mother or sister. Mother Teresa arrived in India in 1929, and started working as Loreto convent School Teacher in Calcutta. Teresa served there for almost twenty years. She began her missionary work with the poor in 1948, replacing her traditional Loreto habit with a simple white cotton sari decorated with a blue border. Mother Teresa founded the Missionaries of Charity, a Roman Catholic religious congregation in 1950 as small order with 13 members. Now it is having over 4,500 sisters and is active in 133 countries. Members of the order must adhere to the vows of chastity, poverty and obedience, and the fourth vow, to give "Wholehearted and Free service to the poorest of the poor". The Missionaries of Charity at the time of her death had 610 missions in 123 countries including hospices and homes for people with HIV/AIDS, leprosy and tuberculosis, soup kitchens, children's and family counselling programmes, orphanages and schools. In late 2003, Mother Teresa was beatified to give her the title "Blessed Teresa of Calcutta". It is the third step toward possible sainthood. Mother Teresa was very fluent in speaking Bengali, the local language of the people of Calcutta (Kolkata). Mother Teresa was the recipient of numerous honours including the 1979 Nobel Peace Prize. She received India's highest civilian award, the Bharat Ratna, in both 1972 and 1980. Mother Teresa stated that earthly rewards were important only if they helped her help the world's needy. When Mother Teresa received the Nobel Peace Prize, she was asked, "What can we do to promote world peace?" She answered "Go home and love your family." In her Nobel Lecture, she said: "Around the world, not only in the poor countries, but I found the poverty of the West so much more difficult to remove. When I pick up a person from the street, hungry, I give him a plate of rice, a piece of bread, I have satisfied. I have removed that hunger. But a person that is shut out, that feels unwanted, unloved, terrified, the person that has been thrown out from society—that poverty is so hurtable and so much, and I find that very difficult." She also singled out abortion as 'the greatest destroyer of peace in the world'. We can read more Quotes of Mothere Teresa here. Her official biography was authored by the former Indian chief election commissioner, Navin Chawla, and published in 1992. Mother Teresa kept the inspiring poem "Do it Anyway" at walls of the children Home. Suggestions from LinkedIn Users for promoting our Motivational Quotes Website "TheQuotes.Net"
We are working on to make our Motivational Quotes website "TheQuotes.Net" as most viewed Motivational Quotes website within this year end. I am looking for various options to achieve it. As part of this plan, I had asked suggestions from LinkedIn users for promoting our Motivational Quotes Website "TheQuotes.Net". Around one year back I have started a Motivational Quotes Website. And, now I am planning to make it my primary source of income as I have decided to hold my other initiatives (e.g script development for clients), because of difficulties in retaining experienced employees. So, right now I am very much focused on getting lot of traffic to my Motivational Quotes Website. As of now, I am doing below things to promote this site. - Done lot of on-page optimization for making it SEO friendly. - Created Facebook page for promoting our Quotes website. - Uploading lot of motivational Quotes videos in YouTube for promoting this website. - Created SMS channel for promoting the site by sending free SMS Quotes. - Created Twitter application for sending Quotes automatically as Tweets. - Our Team is submitting the Quotes pages in many social bookmarking sites. I would like to know any other suggestions for getting good Traffic for our Quotes Site within appropriate time period. I had received many useful answers from the LinkedIn users. I am listing below some of the suggestions. I will look into these suggestions and will work on implement them if they are suitable for our site. And, if you have any other suggestions, you can share them thro' the comment section of this blog post. Sounds like you're doing a lot of great things to promote your page. On the social media front, you might consider adding Pinterest to your outreach efforts. I've noticed a lot of quote images getting passed around there. Another (related) idea would be to "package" the quotes in a consumable way, providing value beyond simply reading and reflecting the words. Computer/mobile wallpapers, email signatures, e-cards, Facebook cover images (for those with Timeline enabled) are some initial ideas that come to mind. These are graphical items that people might like to create after reading your quote, but don't have the time and/or skills to do so. Providing a simple way to incorporate the quote into their lives adds extra value beyond yet another wall of text online. Backlinks are still gold as is video. get some views to the videos, some backlinks to them, some book marks to them. 3) make sure the description section has url to your site, youtube embed code and keyword you have targeted. 4) make sure the tags are properly added too. Make it into a game people can play. Pinterest! Have a designer create graphics for the quotes and start pinning them. Be sure to include your logo and/or web address on the graphic. If you are already getting some significant traffic, you need to look at your web analytic, if you are using GA -look at "Traffic sources" "Top 10 search terms" , focus more on those areas. If you getting traffic from mobile devices it's worth considering mobile friendly website conversion ( or even an app ). Buy adwords if you have some budget. Create loyal visitors & fans, give them some virtual currency, ask their feedback, give them more, rate them, rank them. Let them buy some merchandise, a quote calendar, a poster, T-shirt etc. Convince a talk show host to mention your website. One other think you could do is create a widget to randomly display motivational quotes on websites of others, with a "More Quotes" link at the bottom. Another idea would be to create a "Print Your Quote" functionality that would allow a user to choose a quote and then format it (font, size, etc.) to a pdf. There are so many sources of quotes on the web that one really needs to think outside the box to overcome the competition. It is probably a good idea to consider what a quote seeker really wants to gain from using a quote. Most use them to gain LIKES and retweets on Facebook and Twitter, respectively. Perhaps, a quote dashboard would be a good tool to have. It might keep track of the quotes selected and recommend other quotes with similar themes. It might also track the quotes and determine which ones seem to have the most traction with your audience and other's audience's too. Programming the quotes - Hootsuite-style - might be an additional novelty. Adding photos of the quoted person to your posts and tweets might only be an additional click away. If there can be found a way to have quotes sponsored, it might be a great way to monetize this activity. Games, background information and contests are also great ideas. I am not sure if anyone has built a substantial application for quotes that does more than offer them for use. Everyone is telling about the importance of keeping good Page loading performance for getting good position in Search Engine results pages. But it is NOT clear about up to what level the light weight pages help to get Good SEO rank. So, I decided to find answer by creating a light weight page "Famous Quotes", and monitoring the SERP (Search Engine Result Page) position of this page for the related keywords such as "Famous Quotes" and "Famous Motivational Quotes" in various search engines including Google and Bing. Normally I use Google Webmaster Tools for seeing the change of keyword position for any of our web page. Today I started using Bing webmaster Tool also for doing this test. So, I can consider this page as fast loading page, and if the SERP position for this page is improving very quickly comparing to our other pages, I can say that page loading speed plays important role in deciding the Search position. Let us see the outcome of this test in few months. If this test proves the importance of fast loading pages, I am planning to create more light weight pages. Have you done any similar test? Can you share your findings thro' the comments. Today (August 15 th, 2012) we are celebrating 66th Independence Day of India. The Search Engine Google is showing a Doodle in India (Google.co.in) to celebrate the Independence Day India. Watch the below video showing the Independence Day message from Former Indian president Dr. A.P.J Abdul Kalam. Kalam asks every Indian to think about the question "What can I give to Nation?" And, he wanted to review on next year Independence Day to see the progress made in the 1 year time. And, Dr. Kalam asked people to plant trees. Indian Prime Minister, Dr. Manmohan Singh, addressed the Nation from the ramparts of the Red Fort on the occasion of Independence Day. And, Dr. Singh had said that we would achieve independence in the true sense only when we are able to banish poverty, illiteracy, hunger and backwardness from our country. For making this happen we should learn from our failures and build on our successes. We can read his complete speech here. or read below. No praise is high enough for our hard working farmers. They have produced a record output of crops successively in the last 2 years. Because of our Government`s efforts for development of agriculture and for protecting the interests of farmers, agriculture has grown at an average rate of 3.3 per cent in the 11th Plan which is substantially higher than the 2.4 per cent we achieved in the 10th Plan. In the last 8 years, we have doubled the support prices of crops. We are providing loans at low interest rates to lakhs of farmers. This year we will present the Twelfth Five Year Plan for consideration of the National Development Council. The Plan would determine the future course of action on all important matters relating to the country`s development. It would lay down measures for increasing our present rate of economic growth from 6.5 to 9 per cent in the last year of the Plan. The Plan would focus special attention on areas important from the point of view of reaching the fruits of development to each citizen of our country and specially to the weaker sections of our society. I have full confidence that the Centre and the States will act together to implement the Twelfth Plan in an effective manner. Play Football (Soccer) on Google Doodle Featuring "London 2012 Football"
Google is daily changing its Home page logo "Doodle" for featuring various Games of London 2012 Olympics. You can refer the list of London 2012 Olympics Doodles. Recently Google is showing interactive animated Doodles so that users can play Game on those Doodles. Till now Google allowed the users to play Hurdles, Basketball and Slalom Canoe. The Latest Google Doodle "London 2012 Football" allows the users to play Football-like Game on Google Home Page. This Game looks very interesting. If this Game is not yet visible in your country, you can play it below. Click the play button to start the game. For jumping use space bar. The aim of this Game is, we should block all the balls using Left/Right arrow keys and Space Bar. If we miss to block 3 balls, then the Game will be end. We can use Mouse also for moving the player in the Doodle. Clicking "Left" mouse button will make him to jump. Visit this page to play all playable Google Doodles shown for London 2012 Olympics. How to play with today's interactive Google Doodle featuring "London 2012 Slalom Canoe"
Google is showing interactive Doodle today (August 9th, 2012) also. This playable Doodle will appear only on HTML5 supported browsers. The other browsers will show static image only. Today's playable Doodle is featuring "London 2012 Slalom Canoe". Actually this Doodle is the 14th Doodle from Google for the series of London 2012 Olympics Doodle. And, it is the third playable Doodle. The first two playable Doodles "Hurdles" and "Basketball" had attracted many people to spend their time playing with them. I believe this new Doodle is also going to get the attraction. And, the users can use Up and Down arrow keys also. The Up arrow key will function similar to Left arrow key, and the Down arrow key will function similar to Right arrow key. i-e The UP and Left Keys will action the Left paddle of Canoe, and Down and Right keys will action the Right paddle of the Canoe. And therefore, pressing UP/LEFT key will move the Canoe left side and pressing DOWM/RIGHT Key will move the Canoe Right side. And, key pressing both Left and Right arrow keys will move the Canoe fast in straight path. The river will have around 10 Gates. The speed of the Canoe will be increased if we paddle it thro' these Gates. The purpose of this game is, to finish the end quickly in less time period . And, If the Canoe hits the banks,animals or rock the speed will be reduced, and the Canoe will be damaged too. This "Slalom Canoe" Doodle is bit complex from Google's other playable Doodles (Hurdles, Basketball). Because the objects and﻿ their position are getting changed dynamically every time we restart the Game. So, we can not expect the same game again while replaying it. I got the score of 19.5 with 2 stars. i-e I took 19.5 seconds to reach the end. And, I recorded this play using CamStudio. Have you played this Game? What is your best score? Do you have any tips to get good scores? You can share them thro' the comments. And, if this Game is not available in your country now, you can play here.